We're coming to the end of August now and it appears that my iBiza tan is slowly losing it's soul. Thankfully fake tan exists in all kinds of forms and we can take advantage of these glorious products in order to keep us glowing through till next summer. In all honesty, I'm a bit of a fake tan junkie and it took me a LONG time to find fake tan that suited me and lasted as long as I wanted it to. My first fake tan experience was not great but I was 13 and wanted to look a little bit more sunkissed in P.E but instead of looking sunkissed I ended up looking a colour somewhere between a Wotsit and red leicester cheese - not chic. 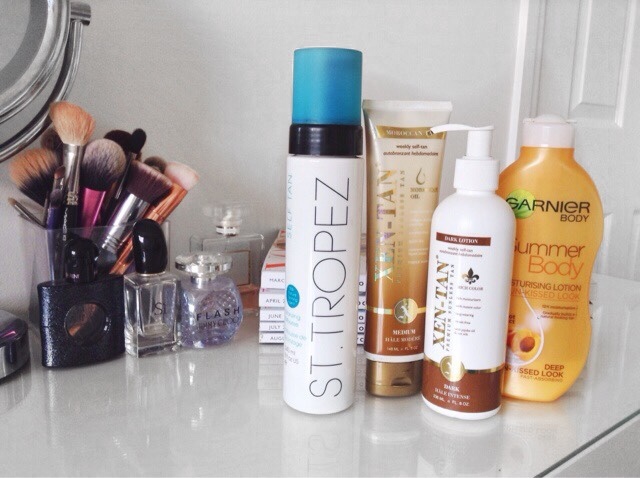 But since then I've been trying different brands of fake tan, different formulas of tan and 5 years later I think I've got the hang of fake tanning and I'd like to share with you some of my favourites! St Tropez Mousse is definitely one of my favourite fake tans, I used this tan for at least 3 years and still use it from time to time now. Because the product is a mousse it glides on to the skin perfectly and I love how the colour of it isn't that dirty greenish colour. I apply it with the St Tropez tanning mitt and work from my feet up to my neck, I usually have to apply two coats to get the desired colour I want but the second layer applies over the first layer really nicely and doesn't go patchy which is always a bonus. I don't fake tan my face as most days I'm wearing a full coverage foundation so I don't feel the need to however, I always make sure that the colour of my foundation matches my fake tan. If you prefer a gradual tan I would definitely recommend the Garnier Gradual tan, the shade I use is dark but they do a light shade also if you prefer a subtle glow rather than a deep tan. This is the only tan that I have found that doesnt make my knuckles and wrists 5 shades darker than the rest of my body, whenever I use it I'm so impressed that the colour doesn't clump into my knuckles and inbetween my fingers like other fake tans do. Another benefit of this fake tan is that not only is it super moisturising but it smells like apricots! Although I do think the smell does wear off quite quickly and you do soon smell like biscuits. 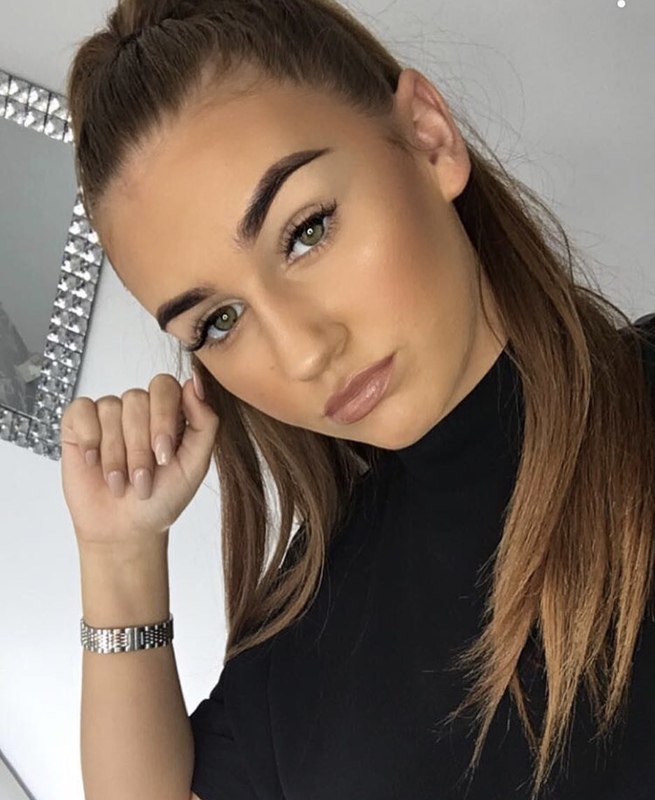 The colour for me is a little bit too on the orange side as personally I prefer a more olive undertone in my fake tan but as a cheaper alternative to the rest of these fake tans - this ones a winner. Okay so this is the real deal, Xen Tan Dark Lotion is the ultimate fake tan for me. I cannot rave about this product enough from the colour to the smell, everything about this fake tan is fabulous. If like me you prefer a fake tan with an olive undertone then this is the product for you, because it's a lotion its really moisturising but it has a dark guide colour so that you know where you've missed out! One coat is all I need for the colour that I want and again I do apply it with the St Tropez tanning mitt working from feet up to my neck. The fake tan smells like cherry almonds and everytime I use it I get a craving for cherry bakewells! (Mr Kipling, come through), if you don't like this smell Xen Tan also do a similar tan called Moroccan Tan which smells like coconuts (really reminds me of being on holiday!). This fake tan never fails to disappoint me, I tend to fake tan on a night time before I go to sleep and when I wake up in the morning I'm instantly in a good mood because of the wonderful results I have from this product. Let me know what your favourite fake tan product is and why you love it in the comments! See you soon!